Betsy Frost has been a jeweler for more than twenty years, but her namesake studio and shop in downtown Ipswich just celebrated its second anniversary last fall! Making the leap from pop-up to permanent, Betsy Frost Design is thriving in its home at 4 Market Street. People still need thoughtful gifts in today’s world, not to get an Amazon box that someone clicked, or told their Alexa to buy. I feel that I’ve become that place where you go if you really need that perfect gift, in my bag, with the tissue, or something handmade. Before opening its doors on Market Street, Betsy Frost Design existed as a wholesale business operating from Betsy’s home. She had long wanted to open a brick-and-mortar store, and in fact, had her eye on the 4 Market Street location since she moved to Ipswich! Her holiday pop-up shop in Ipswich in 2015 confirmed that people were looking for a place to buy unique jewelry and gifts. When the 4 Market Street location became available in 2016, she knew the time was right to make the leap into retail. Since opening her retail space, Betsy has expanded her offerings to evolve with market demands. People often came into the shop looking for Ipswich-themed items, so she started to carry a wide variety of local branded goods. The space’s previous tenant carried clothing, and many people asked Betsy if she was going to do so as well. Now, Betsy Frost Design is a place where you can find a gift for just about anyone. 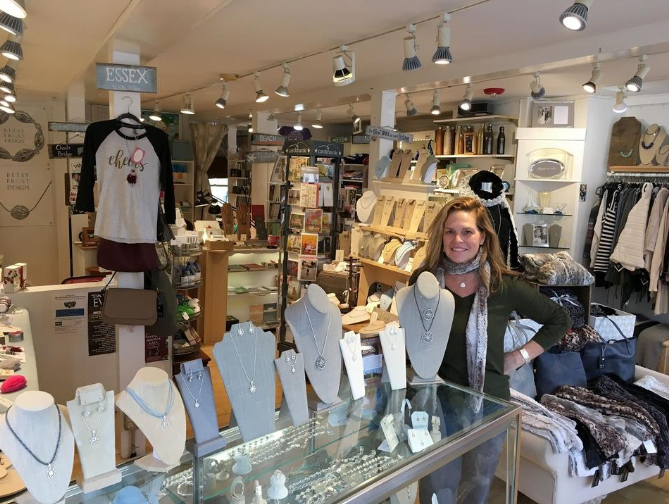 In 2018, Betsy Frost Design was the Wicked Local Ipswich Readers’ Choice Award Winner in several categories, including #1 Gift Shop, #1 Jewelry Store, #1 Women’s Clothing Store, #1 Home Decorating Store, and #1 Children’s Clothing Store. Betsy was recently profiled by Wicked Local Ipswich about the challenges of being competitive as a small business in the era of Amazon and other big-box retailers - read the interview (and see some great photos of the shop!) here!